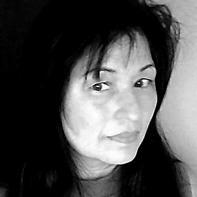 Nancy Chen Long is the author of the chapbook Clouds as Inkblots for the War Prone (Red Bird Chapbooks, 2013). You’ll find her recent and forthcoming work in DIAGRAM, Sycamore Review, Mason’s Road, RHINO, and elsewhere. She received a B.S. in Electrical Engineering Technology and an M.B.A., worked as an electrical engineer, software consultant, and project manager, and more recently earned an M.F.A. As a volunteer with the local Writers Guild, Nancy coordinates the Lemonstone Poetry Reading Series and works with others to offer poetry workshops. She’s currently employed at Indiana University and lives in south-central Indiana. it. Smooth enough to swallow. one widely distributed across many rooms. wouldn't you agree? For her sake, let us say yes. that seem to bear true for a decade. that shines for a few years, maybe even ten. But her heart is still just a hole. Only the most excellent quarries, she’ll say. Isn’t a stone worth living for? with holes. She’ll demand proof. both swaddled in the greenest grass.